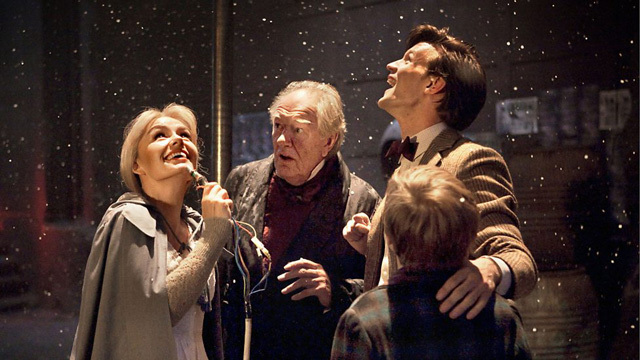 Doctor Who: The Moffat Scripts - A CHRISTMAS CAROL | Warped Factor - Words in the Key of Geek. Dr Moo jumps onto the shark. Matt Smith’s first season as the Doctor had been and gone with a high success rate and with a majority of fans taking 11 with open arms and claiming him as “Their Doctor”. All that was left to do to have him fully established was to introduce him to the casual viewers and then the Doctor has landed. Was the ripoffishly titled A Christmas Carol up to the job? The answer to that is not just “yes” but “HELL YES!” In fact, I don’t think any prior (or for that matter subsequent) Doctor Who Christmas Special could ever come close to topping this one. This one is about as festive as any Christmas Special could ever hope to be, so much so that not even a flying shark manages to ruin things. What ultimately makes this story work is that it was already a story before Steven Moffat got to work on it. There’s a clue in the title people! This is a plagerised version of Charles Dickens’s classic A Christmas Carol, a novel published 167 years before this episode was broadcast and done to death ever since in every way imaginable by everyone you’ve ever heard of in some way shape or form. If you can accept this story for that then we must still give Moffat his credit for wisely deciding to avoid a blatent retelling. He makes several changes. Instead of Ebeneezer Scrooge we meet Kazran Sardick, played by the legendary Michael Gambon. Instead of ghosts of various Christmases we have a time traveller with access to a TARDIS who decides to go mucking about with Sardick’s timestream in a very wibbly-wobbly way. We also have, thrown in for good measure, Katherine Jenkins and a flying shark that likes it when Jenkins sings opera. And all against the background of a plummeting spaceship that has Amy and Rory on board and that only Sardick can stop from crashing because he has a machine that can control the clouds. What we have with A Christmas Carol is effectively a greatest hits album for the Eleventh Doctor. One of his defining charateristics is how well he interacts with children so going to visit the young Kazran we see this in action as he sets about capturing the sky shark. At the other end of the scale he’s also an extremely terrifying man if you cross him, as Kazran does. At one point an outright death threat, but that’s nothing compared to when the Doctor becomes the self-titled “Ghost of Christmas Future” and Kazran dismisses it; he knows his future already. But the Doctor has other ideas! He steps aside and Kazran sees himself as a child. A child who initially mistakes Kazran for his abusive father. A child whom Kazran himself treats in exactly the same way. That’s the Eleventh Doctor’s dark side. He may seem like a big manchild, largely because he is, but when he needs to be he is totally ruthless and merciless. With hindsight you can see what Steven Moffat has got planned for the character in series six: a deconstruction of this powerful monstrous persona the Doctor has developed into since the late Tennant years. Scenes like this one show us all of this side of him that we like to ignore. 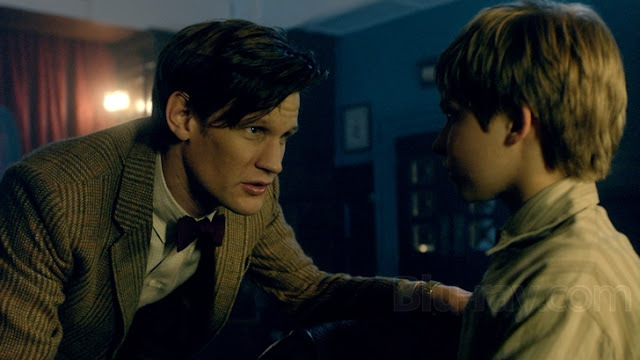 The Doctor is a fighter and he doesn’t necessarily fight with weapons; his actions and words are much deadlier. 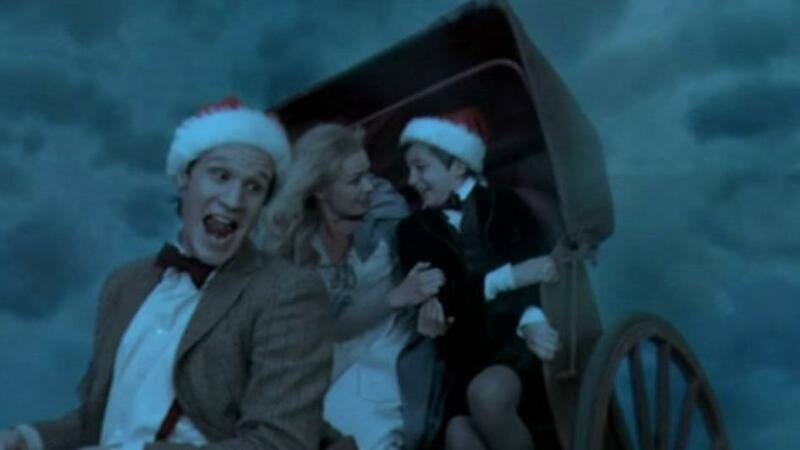 Moffat’s version of A Christmas Carol is more than just about one man’s transformation though, he takes what for Dickens was merely a subplot and makes it the main storyline: Scrooge’s (or in this case Kazran’s) lost love. That’s where Katherine Jenkins comes in, and while she’s not an actress she’s still capable enough to manage what she has to work with and do it justice; miles ahead of last time Doctor Who had a singer in it (Kylie Minogue) which was a complete mess. She’s only given the part because she can sing and just as well because that’s a crucial plot point. Her singing is what ultimately saves the day and prevents the Ponds from dying Adric-style on Christmas Day. The song she sings is actually a genuinely moving piece and while I don’t generally like songs to appear in a television series this is one of those exceptions. When you're alone, silence is all you know. In fact everyone’s acting in this episode is superb. Michael Gambon is brilliant as Kazran, showing us a multi-layered performance as both a cold-hearted miser and his transformed kind self, everything the Doctor changed in him was already there and he just needed the Doctor to bring it out. The young Kazran, both child Laurence Belcher and teenage/young adult Danny Horn, are among the most underrated guest stars ever to appear on the show (though the latter has recently proved his worth with Big Finish’s surprisingly-good Chruchill boxset). I’ve already mentioned that Katherine Jenkins is the weakest link in the chain but still manages to do well enough to pull it off. However it will not come as much of a shock to see that the true star of the show is Matt Smith, showing off his full range and letting everything the 11th Doctor does well have a chance to shine. So is there anything that this episode doesn’t do right? No, not really any that I can think of. 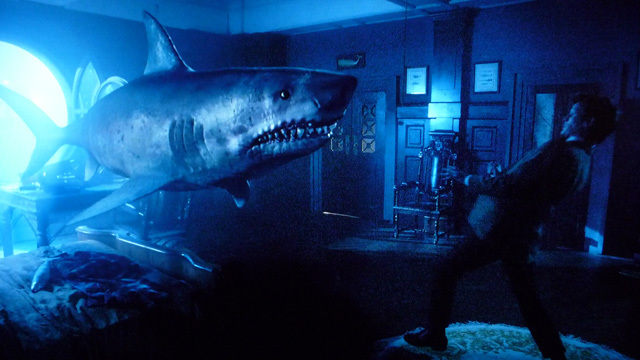 I suppose that the way Kazran’s life is changed is tricky to follow if you think too hard about it, and there’s no need to have a flying shark in there, but really that’s nitpicking and shows just how high the overall quality of the story is. I know it's April and we've only just had Easter, but who cares? Watch A Christmas Carol again anyway! It’s so good in the writing, production, music and acting that the whole thing is a fantastic hour of television regardless of whether you watch it at Christmas or in the middle of springtime. Truly magical, that’s what this episode is, pure unadulterated Christmassy magic. Watch it again today.